My day started with getting up at 4:35 although my alarm was set to go off at 4:45. I had a horrible night sleep due to frequent bathroom trips and never really getting into a deep sleep. I dreamt that I had completed a 30k trail race at a ski resort, which I hoped was a sign of good things to come.I prepared oatmeal in the room along with coffee and got ready. I had a prepped bag to check for post race along with a throw-a-way sweatshirt. Francine, Aimee, and I headed down to the lobby just after 5:30 and were greeted with water and bananas and a few shuttle bus volunteers. We were directed to “the middle bus” which was quite full and warm. Shortly after boarding, we departed for the start line. 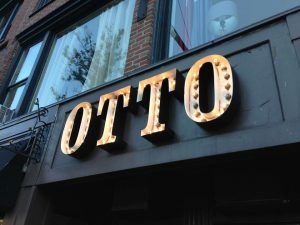 The ride was short and we headed to Logan Circle to meet up with Dimity and the other BAMRs for silly toes. Afterwards, we dropped our bags to the large trucks which were alphabetized by the first 3 letters of your last name. We then headed to the portapotties where we met up with another BAMR, Monica from Denver. The national anthem was sung while we were in line. After a quick group selfie, we headed to our respective corrals. 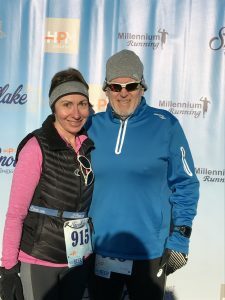 It was sunny, 39* and 19 mph winds at the start, which made it feel like 30*. I started with Jennifer Z. and Stephanie H. in the blue corral. I ran with Jennifer for a few miles before she set off ahead of me. I hooked up with another girl (?Greta) for a few miles, who had done an Olympic triathlon but no more than a 10K. I left her after mile 8 and then was on my own. I saw Melissa near our hotel just before mile 8 where she took these pictures. The weather was sunny, cold, and light wind for the first half. My nutrition was on the hour, every hour and I took in ½ Honey Stinger waffle or a mini Larabar each time. I took water at most stops as I walked through them. The hill up to Please Touch Museum was a long one and exposed towards the top. I passed so many people from that point on and the only people who did pass me were those who went off course to pee and then jumped back in. I enjoyed miles 12-13 by the river facing downtown. The clouds increased and the second half felt much colder and significantly more windy. 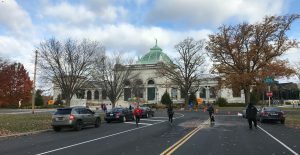 It was hard to go by the art museum and turn towards Kelly Drive and see all the runners coming towards the finish line with all the spectators facing them. 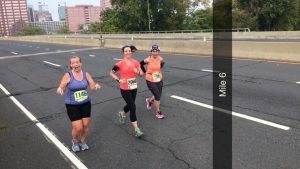 I saw Melissa, Dimity and Tamar at mile 15/25 and yelled across the street to them. 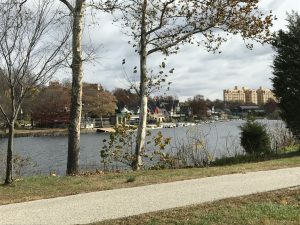 Miles 15-18 felt long, but once I was past Falls Bridge, things changed. 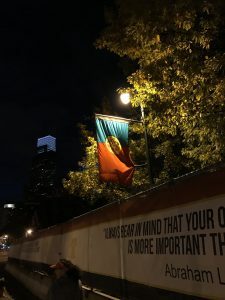 as I approached Manayunk, I felt strong. There was great energy and quite a few different groups cheering us on including a beer stop, candy, and orange slices (which I did not partake). There were some funny signs that made me laugh and lots of police presence at all intersections so I thanked many officers. In general, there was a large police presence in the city all weekend. The police motorcycle motorcades were kind of ominous and the huge crew of police bicycles was strange. As far as my numbers go, I had programmed my Garmin with a workout based on HR caps, but at the start line, I just pressed start and immediately was beeping because I was >140. 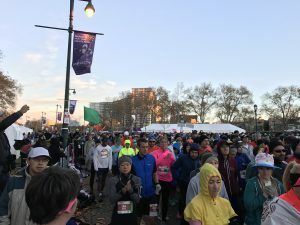 I stopped my Garmin and chose the workout labeled Philly marathon. After about 4 miles, I wanted to change my screen display, but instead hit the lap button, which then put me ahead of where I should be. I then stopped my Garmin and saved the workout as part 1. 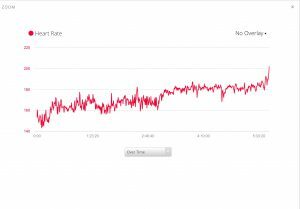 I ended up turning off the heart rate alert and just ran monitoring my numbers. In the end, my average heart rate was 181. I progressively increased my heart rate every hour since I was no longer following a specific workout. 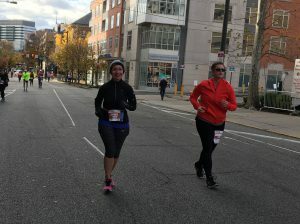 I went into this marathon with no specific time goals. 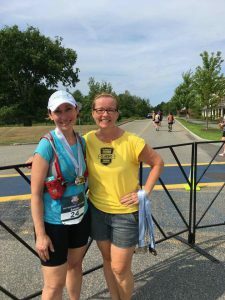 I wanted to be part of the BAMR fun and finish feeling happy and healthy. I had no physical issues and so I accomplished my goals. Thank you to Melissa and Dimity who stayed at mile 25 to see me. 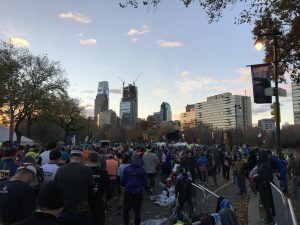 Philly was 17:41 slower than my first marathon (MCM) last fall (13:06 vs.12:26 pace), but 5 minutes faster than my second marathon (Hartford) six weeks ago. My official time was 5:43:44. 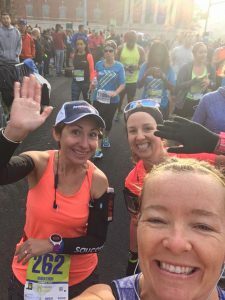 This was my 2nd marathon completed and although I did not run it faster than my first – MCM last fall, it was better than it, in so many ways! 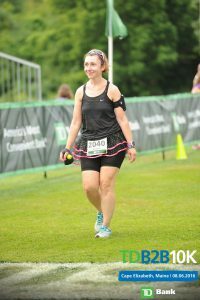 My A goal was a PR (<5:26). 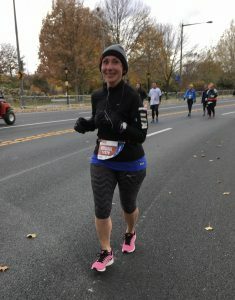 My B goal was a negative split – second half faster than first half (Steava back half challenge was an extra motivator). My C goal was to beat the course time limit which was 6:00. 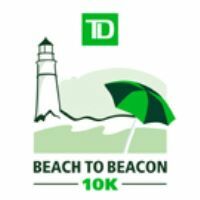 I am proud to say that I met my B goal with 3:00 vs. 2:48! I woke up at 5:35, got ready, and went down to the lobby to go to Starbucks which opened at 6. There was a line, but it moved along and I was able to get some oatmeal with dried berries and nuts. I had breakfast in the room and was feeling pretty good, having slept about 7.5 hours. 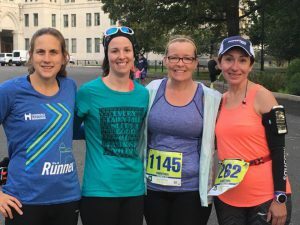 We left our room around 6:45 and headed to the start area which was in Bushnell Park, which was about .5 miles from the Downtown Hartford Marriott, where we were staying. 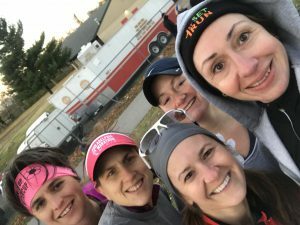 I made a porta potty stop on our way to the start line before meeting up with a group of BAMRs. 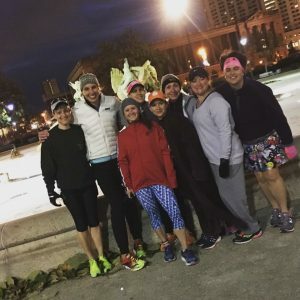 I met 3 of 5 women from our heart rate training group at the cannon in front of the Capitol building at 7:15. 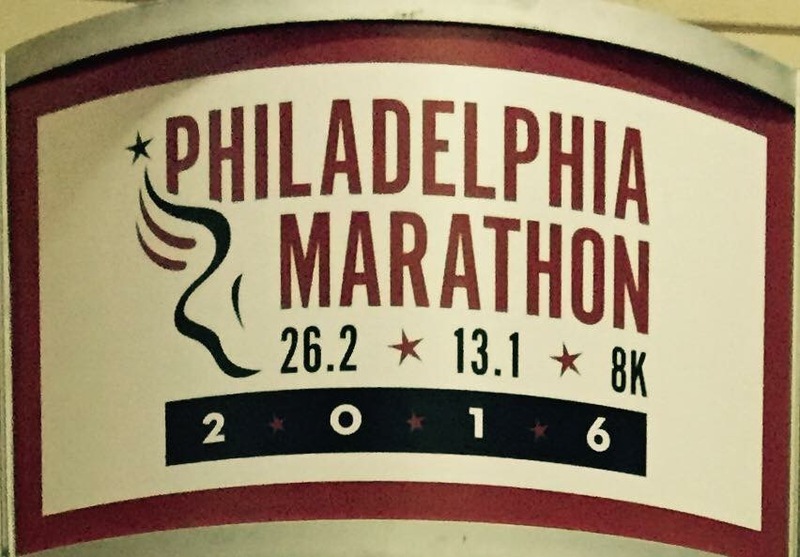 We then split up, but Meaghan and I headed to the porta-potties one last time before heading to the start line. I listened to the national anthem and a blessing and waited for the start with Meaghan and Melissa. The gun went off and we moved along with the crowd slowly. 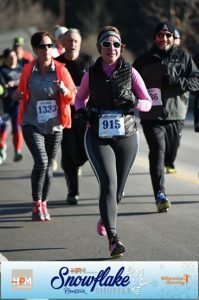 My heart rate was already high and I knew that it was because of the excitement of the race. I quickly realized that I would not be able to stick with my race plan (see below). All three of us, we’re higher than we wanted to be, and we shuffled along at a below-target pace. 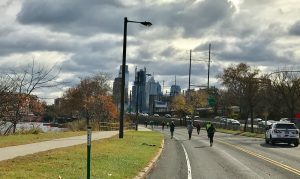 Although I was not able to keep my heart rate within the parameters of the plan without getting swept, I did keep to the premise of start slow and gradually increase. The course limit was 6:00 which meant a pace of 13:44/mile. We told ourselves to “let them all go” and watched everyone run passed us. This was a challenge because we all had energy and could go faster, but we committed to the plan. the three of us were last for MILES! We stuck together, and the cops followed us…closely!!! We were lucky to find Melissa’s family at different points as well as Brian and Brenna during the first half. This gave us many photo ops. We had a motorcycle, a car with ALL its flashers, and a couple of bicycles with us. We carried on with our modified “don’t-get-swept”plan for several miles, running 13-14mm with HR too high. 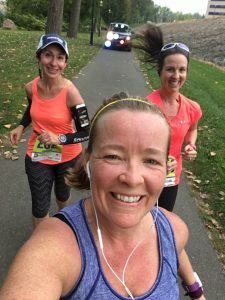 Eventually, the police pulled up next to us and told us that he was leaving us to follow other runners since we were no longer last-thank goodness! I would NEVER have succeeded as well as I did today without these ladies. It was not just hard to be the caboose for miles…it was stressful with them tailing us so closely. The three of us made it to 13.1 together and then started slipping apart as we tackled the next section. I decided to continue with my plan to increase my heart rate as well as my pace and did so with little difficult. I was on my own for the rest of the race, and made it a point to acknowledge every person that I passed. On the out and back, I enjoyed seeing Melissa and then Meaghan. I passed a total of 88 people (I may have missed a few because it was hard to remember in the later miles). I ran almost the entire second half and walked through water stops. My fueling plan worked great and I had NO nausea, which is a win for me. I took 1/2 waffle at hour 1 and the other 1/2 at hour 2. At hour 3, I took in 2 balls. At hour 4 and 5, I took in 1 ball each hour. I stopped at most water stops, and only drank water. 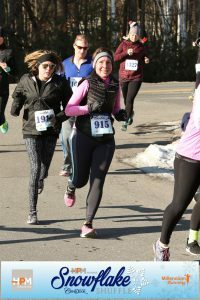 The weather was mostly cloudy and 48 at the start, but warmed up to the high 60s. 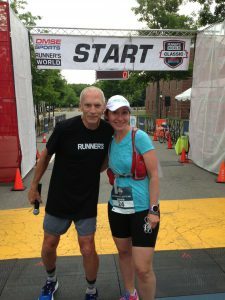 My husband and daughter were waiting at the finish line where I came in with the 5:45 pacer. 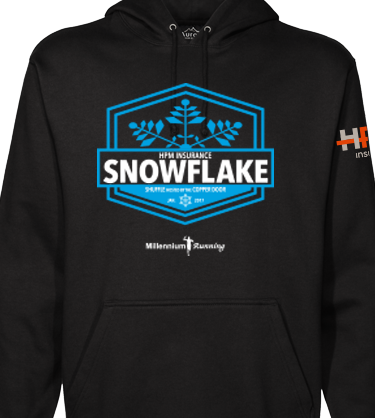 Last year, I claimed this to be my favorite race of all time and I was excited to be able to participate again this year. 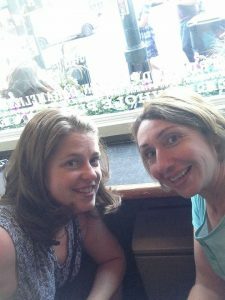 My bestie, Sarah and I traveled up together on Friday afternoon. The expo was great again and we were surprised to receive lots of gift cards – a $10 LL Bean, a $10 Olympia Sports, and a Dunkin Donuts. There were samples of food as well. We got great magnets and awesome tech shirts too! We opted to go to dinner in downtown Portland and it was great. We chose to sit at the counter in the front window so we could people watch, since it was a crafter’s evening and there were many folks walking around downtown. 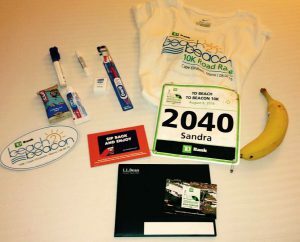 Back in the hotel room, we laid out our goodies while we watched the opening ceremonies for the Summer Olympics. In the morning, we stopped at Dunkin Donuts for breakfast before heading to the shuttle bus at the Hannaford lot. We arrived around 6:30 and waited in line. The drop off was further away than last year, so we had a nice long warm up walk to the start area. Once again, there were tons of porta-potties, which made for short waits in lines. The start line was crowded as usual. We waited amongst thousands of others for the race to start at 8am. 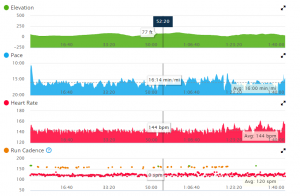 Sticking with the heart rate training plan was not easy. 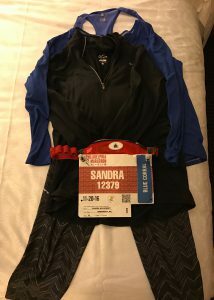 I had to walk from the beginning and I sent Sarah to run her own race, since I was going to be much slower. My run cadence shows just how much walking I did. Being at the back of the pack has its perks. 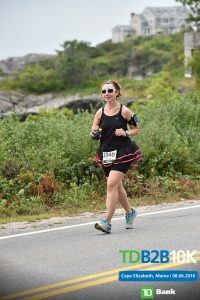 You get great solo shots and don’t get blocked by other runners. The volunteers are also so happy to see you at the water stops and cheer you on enthusiastically. You get spectators shout encouraging words and comment on your outfit because you are not part of the crowd. The downside of being so slow is that you have far fewer spectators along the course as well as at the finish. 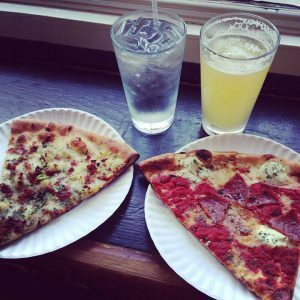 You also miss out on the food for runners especially if you watch the awards, which we did. The highlight of the race for me was my finish when Joan Benoit Samuelson [American marathon runner who won gold at the 1984 Summer Olympics in Los Angeles] came towards me to shake my hand and congratulate me. 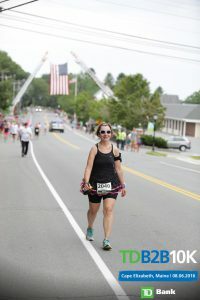 There were a total of 6345 finishers, so I was not alone in the back of the pack. As I sit here reflecting on this race, I realize that there were many factors that contributed to it not being a great day. I was traveling on my own given Brian’s training schedule. This is atypical since both he and Brenna typically accompany me to my races. I woke up [later than I should] and felt rushed although I had all my things laid out and ready to go. I was sweating even before leaving the house and once outside felt very warm. It was 73* and sunny with 73% humidity. I took my oatmeal to go and ate it on the way, but was not able to finish it. I did not have a long time to wait before the start which is not usual for me. A highlight of my morning was seeing Bart Yasso at the start line. Today was a real test of my commitment to this process. 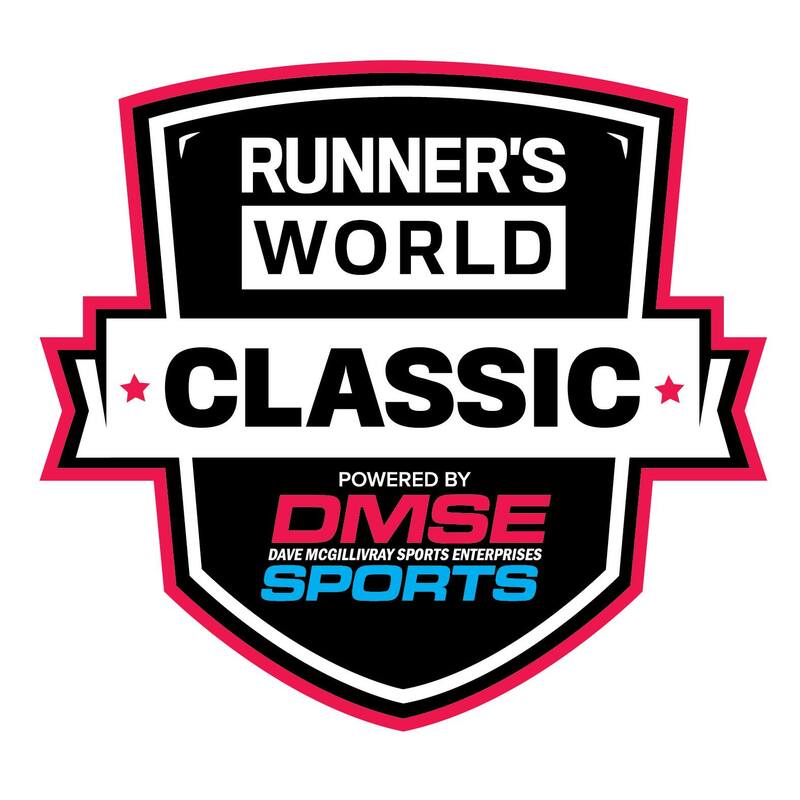 I “completed” the Runners World Classic half marathon. 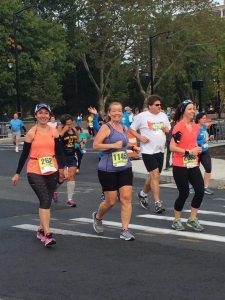 I say “completed” because I ran 10.48 miles – not 13.1. 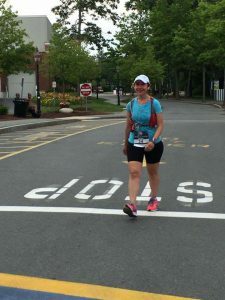 I was detoured at mile 7 and rejoined the race course just prior to mile 10 because I had fallen too far behind the 3:00 time limit. 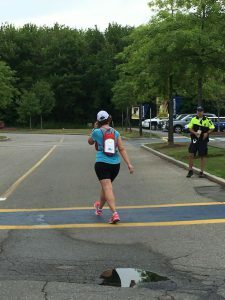 I was the last runner for the first 3.5 miles and thought I might get lost since the 2 women ahead of me seemed to be walking/jogging and I was only walking. My heart rate was 152 at the start line and I really struggled to get it below 140. 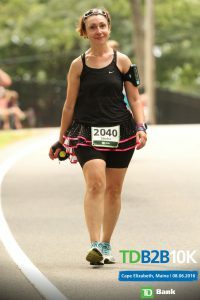 I walked almost the entire course and did try to shuffle a few times when my heart rate lowered but it would quickly rise and I would have to stop and walk again. 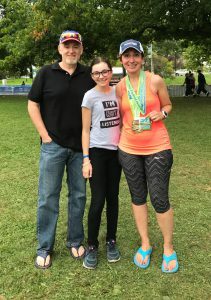 I was so grateful for words of encouragement along the way from Melissa [my new Facebook friend from the AMR HR marathon training group] who was volunteering at the finish line. It was great to see her and Bart Yasso around 3 miles too. In summary, Yes. I was in last place in the race for over 3 miles. Yes. I had to be detoured because I was way over the time limit. Yes. I walked virtually the whole thing. Yes. I was asked to move to the sidewalk because they had to open the roads. Yes. I was asked if I was still in the race. Yes. 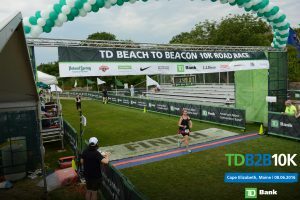 I stayed true to my heart rate marathon training plan.